While vaccines continue to save countless lives, many people never receive this simple form of protection. To inoculate more people against diseases, clinicians need an easier, more effective way to safely store vaccines and manage inventory. Each dosage is fragile and expensive. Standard vaccines can cost $100, while biologics—vaccines used to treat people with autoimmune disorders—can cost $10,000 per dose. To avoid spoilage, most vaccines must be stored between 2º to 8º Celsius. However, the commercial refrigerators used by clinicians provide imprecise temperature controls. And because standard refrigerators require reliable electrical power, clinicians are unable to use them to store vaccines in under-developed areas. Plus, clinicians stock and access vaccines manually. This introduces inventory errors and loss due to inadvertent spoilage and theft. To overcome all these storage and inventory challenges, Weka Health Solutions envisioned a Smart Fridge solution that provides automated controls supported by the Internet of Things (IoT) and the cloud. Weka wanted to provide clinicians with a refrigerator designed specifically to store vaccines. Not only would it include remote monitoring services that ensure vaccines are stored at the right temperature, but also its Smart Fridge would come with automated inventory management services. To bring its product to market, Weka first engaged a vendor to design a physical refrigerator that has cartridges that store each vaccine in its own slot. Each slot is at least 3 inches away from the side of the Fridge, which is required storage protocol by the Centers for Disease Control and Prevention. In addition, people can only stock and access vaccines through a small drawer on the front of the Smart Fridge that measures less than 8 square inches. This design protects vaccines from temperature change by minimizing the influx of warmer, outside air. SQL Database stores each telemetry data message with a time stamp so analytical processes can monitor the health and temperature of every Fridge and quickly identify any anomalies that indicate a possible appliance issue. DocumentDB stores a standard appliance manifest that the Fridge accesses when it is first powered up, and a current snapshot of Fridge inventory. BlueMetal chose DocumentDB to store inventory information because its unstructured format makes it easy to support future business intelligence (BI) solutions. Blob storage serves as an affordable historical archive that includes every message every Smart Fridge generates over its lifetime. Service Bus supports communication with Dynamics CRM Online. BlueMetal and 2B Solutions also collaborated with the Smart Fridge manufacturer so the kiosk software controls the Smart Fridge. For example, to add or dispense a vaccine, clinicians log onto the kiosk and specify what they need to do. The Smart Fridge then pops open a door with access to a single vial. If they are adding to inventory, they insert the vaccine into the slot; if they are dispensing a vaccine, they remove it from the slot. Once the clinician closes the door, the kiosk sends a message to Azure and then to Dynamics CRM, noting the inventory change. By using a Smart Fridge, clinicians can also save money. Weka Health Solutions estimates that a medical practice that dispenses approximately 400 vaccines per month could reduce human-resource costs by more than $1,000 per month. Practices can also avoid losing thousands of dollars per month in reimbursements, which happens when staff forget to record vaccines correctly in patient records. In addition, practices can avoid losses due to vaccine spoilage. Weka Health Solutions and clinic employees are notified in real time via email or text message if the temperature of any Smart Fridge begins to change, so the appliance can be proactively serviced. From the Weka Health Solutions portal, users can also access information about their Smart Fridge from a customized dashboard supported by Azure IoT Suite Dashboard. Clients’ dashboards show real-time information about their Fridge including its temperature. In addition, they can view real-time inventory information and an event log that shows when individual vaccines were stocked and dispensed—and by which users. 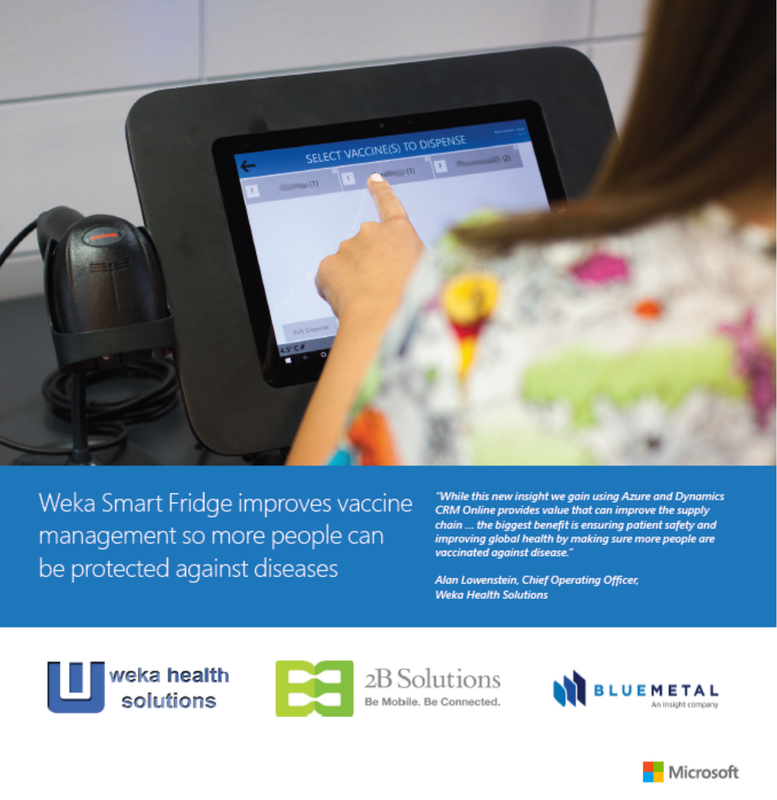 By choosing Azure as the software foundation for its Smart Fridge, Weka can easily develop new services for clinicians. For example, it can develop BI that shows vaccine usage over time so they can better predict upcoming demand. “With data collected in Blob storage, we can easily pull that into Azure Machine Learning or Hadoop to create more advanced types of analytics,” says Familiar. In the future, Weka could also grant vaccine manufacturers access to specific types of data through its REST APIs so they can better understand the supply demands specific to each region. Weka’s Smart Fridge is currently scheduled to go to market at the beginning of 2017. Headquartered in Boston, Massachusetts, Weka Health Solutions strives to improve global health by developing innovative, data-driven products and services for life sciences organizations, including physician offices, research institutions, and pharmaceutical companies. THIS SUMMARY. Document published June 2016.